Kornél Mundruczó’s “White God” is a curious creature. Ostensibly, this is the tale of the fierce bond that binds the teenage Lili (played with impressive maturity by the elfin Zsófia Psotta) and her mongrel mutt Hagen (Luke and Body) together. However, Mundruczó envelops this story in a somewhat suffocating layer of allegorical social commentary that belies a considered intelligence, but ultimately results in a tonally uneven picture. That said, “White God” picked up the prized Un Certain Regard award at Cannes, rightly rewarding Mundruczó for his innovative and ambitious vision, which — while flawed — is at least a fiercely original piece of work. In a visually impressive prologue, Lili cycles slowly through the deserted streets of Budapest, when suddenly, accompanied by a sizeable army of dogs, Hagen careers along behind her. It’s an immersive and engaging introduction to Lili and Hagen’s narrative that poses a plethora of questions, before we flash back to Lili and Hagen being unceremoniously dumped on her father, Daniel (Sándor Zsótér), by her frosty mother, Elza (Lili Horváth). It isn’t too long before Hagen’s mischievous ways put untold strain on their relationship; and Daniel callously abandons him by the side of the road. Accompanied by Asher Goldschmidt’s soaring, sometimes overly dramatic orchestral score, Hagen — driven by his inquisitive nature and a desire to be reunited with Lili — joins up with a motley gang of strays. What follows are a series of impeccably shot unfortunate misadventures as Hagen encounters the dog pound and a brutal dog-fighting trainer who slowly break his will in particularly barbaric fashion. With Mundruczó utilizing some effective and frenetic point of view camerawork, the sense of realism is heightened and at times that makes for uncomfortable viewing. Lili meanwhile is similarly lost without Hagen, and — by exploring her darker side — goes off the metaphorical rails in her hunt for her beloved companion, perhaps reflective of Hagen’s metamorphosis into a ruthless killer. It’s at this juncture that “White God” ebbs toward the uncertain, as Hagen rallies his downtrodden canine brethren to rise up against their erstwhile oppressors and create dog-based chaos. Mundruczó’s measured narrative gives way to bloodthirsty moments of horror, most reminiscent of “Cujo.” But while visceral, they are also sometimes unintentionally mirthsome. It’s this jarring shift in tone that ensures that Mundruczó’s attempt to drive home his didactic message about the flawed nature of the relationship between master and servant — or on a more macro level class — lacks the coherence it demands. What is clear is that this story of girl and beast is a metaphor for the dangers of suppressing a potentially dangerous underclass. In effect, the dog has teeth; and while it might wag its tail, it has the ability to bite back. “White God” is certainly a refreshing and novel take on this perennial struggle, elevated by Mundruczó’s masterful eye (the final shot is a thing of beauty) and a trio of fine central performances by Psotta as the plucky Lili and Body and Luke as the characterful and spirited Hagen. 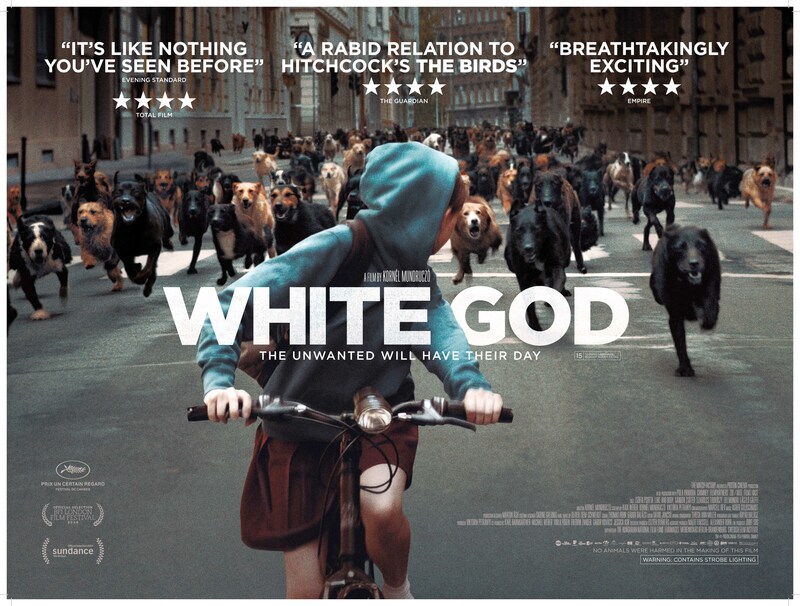 And while it might suffer from an abrupt shift in tone, veering from touching drama to uncompromising horror tinged with accidental comedy, there is more than enough craft, heart and invention on display here to ensure that “White God” is more pedigree than mongrel.